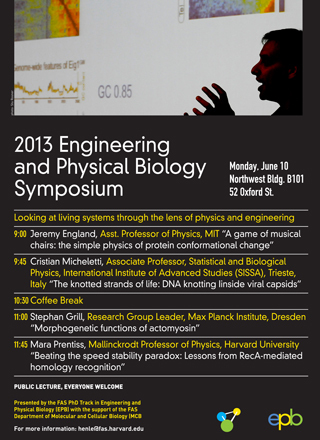 On Monday, June 10, the annual Engineering and Physical Biology (EPB) Symposium will be held in Room B101 of the Northwest Building, 52 Oxford St. Speakers from constituent fields -Physics, Engineering, Chemistry and Molecular Biology – will present significant recent findings ranging from the physics of protein conformation to DNA knotting. The day will be divided into two parts. The morning (until 12:30 pm) will be a public symposium featuring four visiting faculty. (See poster to your left) The public is welcome to attend, and the talks should be of wide interest to the Harvard science community. Work at physics and engineering interface is rapidly becoming an established part of the life sciences. EPB particularly welcomes members of the MCB community to engage with these speakers working on the frontiers of physical biology.